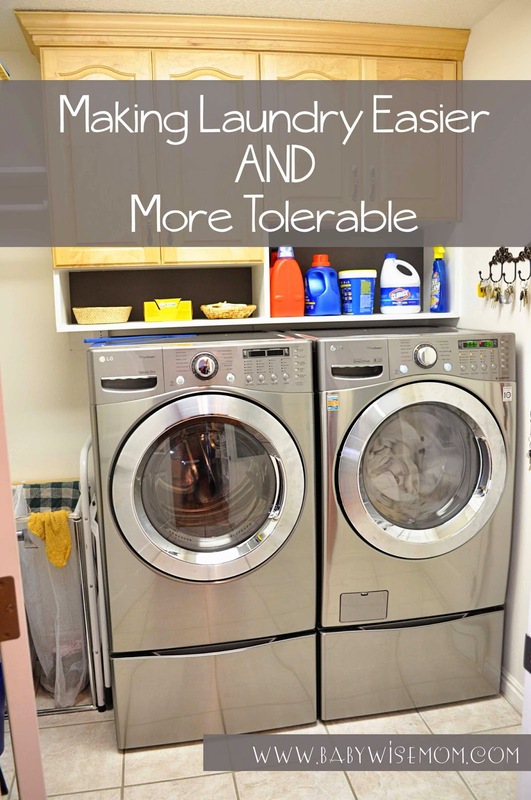 5 Tips for Making Laundry Easier and More Tolerable! How to make laundry day easier. These tips are fantastic for families. Find products to make the day easier and how to get kids involved. If you have been reading my blog for an extended time, or if you have read back through a few of my posts on cleaning, then you have probably picked up on how I feel about laundry. Spoiler alert–not good. I wasn’t sure why I dislike it so, but I have pondered and come to a conclusion. I hate laundry because it takes FOREVER to be able to cross it off my to-do list. 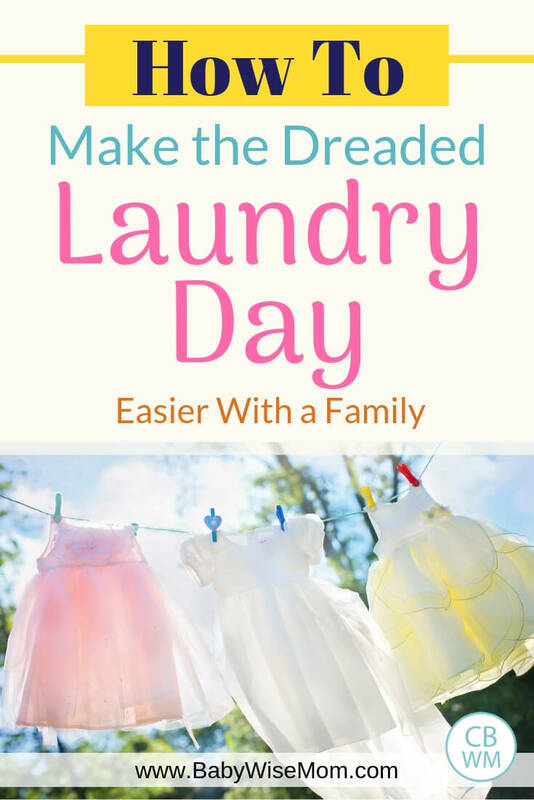 I like to do my laundry all in one day (see how I organize my cleaning schedule here), but even if you are a one-load-a-day type, it isn’t that you spend a good 20-30 minutes and it is done. No. You spend your time to sort, then start a load. Then you wait. Then you move it to the dryer or clothesline. Then you wait. Then you can fold and put away. I like to get my chores done and over with first thing, so to drag it out is pretty much torturous for me. And THAT is why I hate laundry so. But, as I shared in the past, I have been working on improving my attitude toward laundry. And in my efforts to do so, I have found some things that work to make it a bit more tolerable. (for previous tips, see Quick Cleaning: Laundry Day. I found some smaller hampers to use and replace my older ones that took up more space. This way, I can have more hampers in the same area–which means laundry can be automatically sorted as it is put in hampers. This means less sorting on laundry day. Follow me? Easier. In my closet, I have one for brights, one for whites, and one for darks. As laundry is put in a hamper, it is sorted. Along the lines of sorting, I have my children start to help sort laundry from a very young age. It doesn’t take long before a child can sort her own laundry all alone. Your toddler can help you sort (or “help” you sort). By the time your child is four, you can start to expect independence in the sorting department. Having children help with chores is not easier initially, but as they become adept at some of the chores, it helps spread the burden of caring for the home across more of the entire family instead of just mom and/or dad. A huge annoyance with laundry is folding socks. You have to sort out the matches, and then match them, and then the most annoying aspect of all is when you have that stray sock that apparently was “eaten” in the laundry process of the day. If you find this annoying, also, try this out. 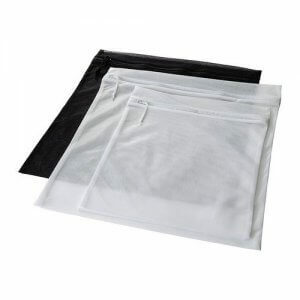 Get a garment laundry bag. Give one to each person in the family. As that person takes socks off each day, that person puts the socks in the bag. Then on laundry day, you zip it up (important step here–zip it up. If you don’t, it negates the whole process. We have learned through sad experience). Put it in the washer. Then move the bag to the dryer, then that person gets the bag back and can fold the socks and put them away. It isn’t a perfect solution, and it takes cooperation from the kids, but it can work if you can get the family on board! A job I give kids when young is to have them fold socks. I have each person fold 10-15 pairs of socks each Monday as we do laundry. Side note: If you ever need to wash a stuffed animal (because puke happens! ), put it in one of these bags. Do you have stains? See my tip for getting laundry stains out here. I set it to start so that the load finishes right before I wake up in the morning. The next morning, I wake up and the first thing I do is move that load to the dryer and start the next load. This is my favorite tip! (so why put it at number 3? I don’t know, that is where it landed). It shortens the day of laundry, which I like, so it is a huge bonus for me. So a side-tip to this one is to figure out what it is about a chore you don’t like so much and figure out a way to solve or relieve that problem. My kids help a lot with laundry. They sort their hamper (they only have space for one so their laundry needs to be sorted). Then they are in charge of folding all socks (ha ha!). They help fold loads. Then they put away what they are able to put away. My kids start putting their own laundry away at age 6. Actually, my three older kids were all independent at 6. Brinley is 6 and not fully independent (she gets help with things hung up), so I need to get on that! In the summer, I have each child fold one load of laundry. During the school year, I will usually have two fold one together and one help mom or dad fold a load. Since they are home more in the summer (and home when laundry is being done), I have them step up their chores in the summer. I have my children take over their own laundry at age 12. They wash their own clothes in their own load. They move them to the dryer. They fold and put them away. When that happens, I no longer require help folding the family pile of socks because they just take care of their own. I have them do their own load on a day other than Monday (my laundry day). It is so easy to have younger children in the family birth order start independent tasks later than older siblings did. That is why it is helpful to take note of what age each child did things. 6 year old Brayden had two little sisters and a baby sister on the way. He looked much older to me than 6 year old Brinley who is the baby of the family. I find doing all loads in one day the best option for me. I also find most moms agree with that, so if you haven’t tried it, give it a try. Some moms prefer one load a day. We all have different tolerances and preferences, so figure out what works for you and do it. You could break things up a bit. All washing, drying, and folding one day and all putting away another day. I surveyed my friends and got some more good tips. Most came from my friend Laura, mom to 10. She obviously needs to have her laundry streamlined to maintain some measure of sanity. I have heard from several moms over the years who just put clothes in drawers without folding. It is a great time saver. Laura buys one style and color of sock and everyone just shares those. Then there is no need to sort or match socks. And another friend mentioned that mis-matched socks are in style right now, so if you ever want to try this out, now is the time to do so! 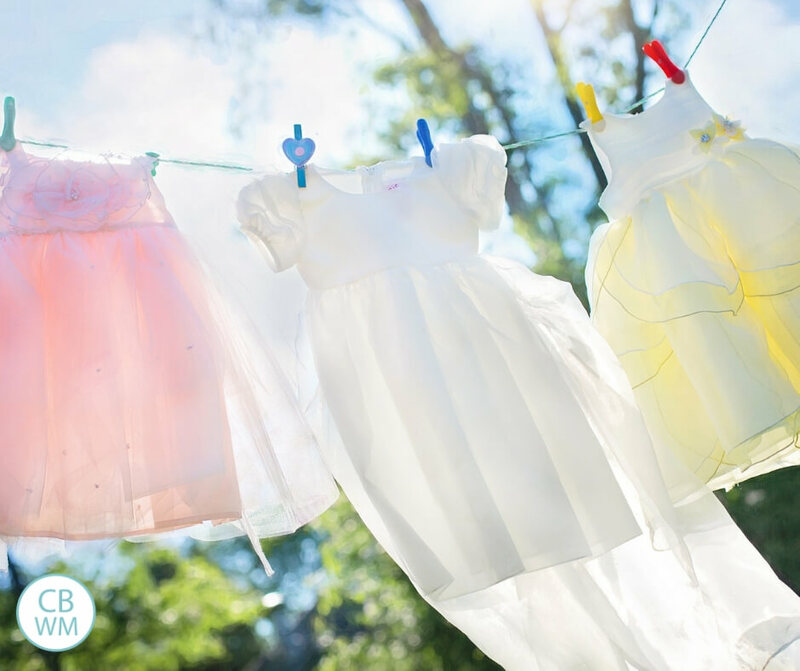 Another friend, Brooke, said she washes each child’s clothes in their own load on cold and doesn’t bother with sorting them into different loads. 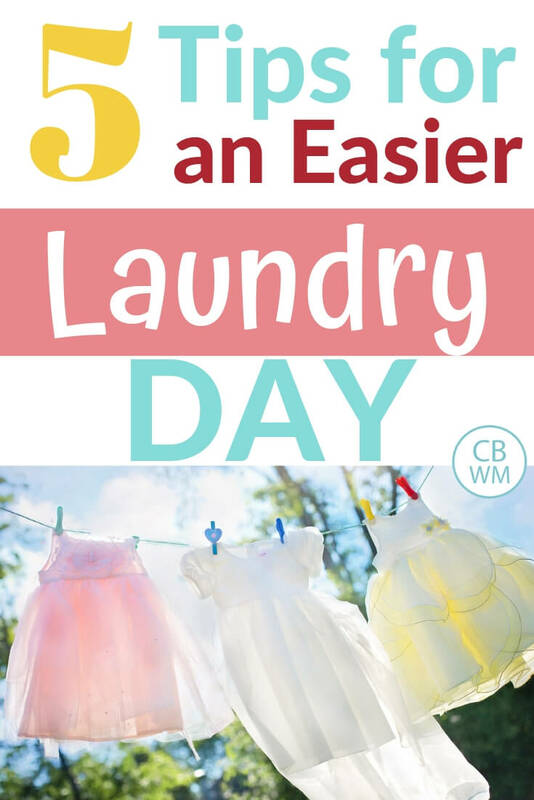 These tips can help you make laundry day easier. They say to look at your laundry and be grateful that it means you have people you love in your life. It is great to have perspective like that, but the day to day grind gets difficult and overwhelming at times. We need actionable tips to make laundry life easier. I don't sort the kids' clothes by color either. Each kid has a laundry basket and I toss all their clothes in on cold or warm and that's it. I've never had a problem with colors bleeding. If you need to do a load on warm/hot because of pee accidents then just use 1 cup of vinegar…it cuts urine smells and it prevents colors from bleeding at all. But yeah, I still hate laundry, I am trying to find ways to streamline but so far it's still daunting. My husband does our laundry since is my dreaded chore and he doesn't mind it. However, he refuses to sort colors for our laundry or the kids loads. It freaked me out at first because i was taught to sort. I just made a resolution that since he was doing it i would let him do it his way. In 7 years he had only ruined two shirts doing laundry this way! Wash on cold or warm. Towels are separate on hot. I'm not convinced now that laundry needs to be separated like we were all taught to do. Red shirts with white shirts do fine on cold. IF something does turn pink or is looking dingy go find RIT on the laundry aisle at the store. It's been around for ages and really does work! I found a laundry hamper at walmart that is on wheels and has four hanging bags on it. I labeled each bag according to my sorting preferences and family sorts as we take off our dirty clothes. This way when it comes to laundry day, I can wheel the bags to laundry room and do one bag at a time. Sorting is already done! I love it!